Discussion in 'Online Casino Promotions' started by Ellis, Jul 17, 2014.
both so much fun! Enjoy a robotic rendezvous in the 90,000-coin jackpot slot! 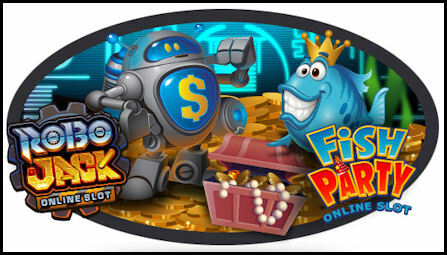 Or go for the lucky streak, under the deep sea in the 97,000-coin jackpot slot Fish Party! play both to receive double loyalty points. So each 10 you wager gives you not one, but two loyalty points. These points are a great way to extent your playing time at the casino. If you have collected enough points, you will be able to redeem them instantly for extra casino cash. This offer is valid only until July 31, 2014. So what are you waiting for? Login now and start playing today! I would love to know what you think of these two latest releases. We wish you all lots of fun and many big winnings at Royal Vegas Casino and the other Fortune Lounge Casino's. You can still claim double rewards!